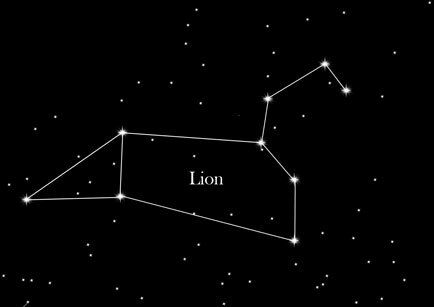 The Lion is a strikingly distinctive constellation of the spring skies. As well as lending its own grandeur to the night sky, the constellation also has an astrologically significance as it is located on the ecliptic line, making it one of the 12 zodiac signs. The Lion is distinguishable by a curved star line, which is also known as the “Sickle”. This line is said to represent the lion's mane. Such bright stars as Denebola, Regulus, Algieba (γ) and δ Leonis form the body, whereas the stars ζ μ and ε Leonis constitute the head. Also, a couple of notable binary stars can be observed within the Lion constellation. In the Greek mythology the constellation presented the “Nemean Lion”, which ravaged towns and dwelled in the vicinity of the town Nemea. Thanks to its extraordinary fur, the lion was invulnerable to any attacks – all weapons simply bounced away on hitting it. Slaying it was one of “Heracles's” - also known as “Hercules” - twelve labors given to him by his father Zeus. After a failed attempt to do so with a sword, he strangled the lion with his bare hands. Later on Heracles wore the fur and was himself invulnerable. The God Zeus, however, honored the Lion by giving him a place on the firmament. Astrological significance: People born under this sign are regarded as sociable, self-confident and blessed with success. Their generosity and egoism very often make them ideal leaders. Nevertheless they are good at heart, thanks to which they have many friends. Fire is their element.